A modern chrome thermostatic bar valve from Ultra with a practical shelf for storing shower gels, soap etc and a riser kit. Features a trendy design with clean lines, style allows you to maximize the space you have. 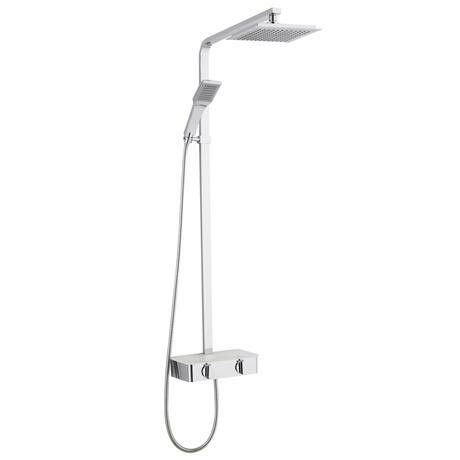 Riser kit consists of a stylish angular design overhead shower and a handheld handset for extra flexibility. Bar valve has separate controls for temperature and flow. Comes with a 10 year guarantee. The sleek and stylish Modern thermostatic bar valve with shelf and riser kit from premier offers a stunning chic for any modern bathroom. The contemporary style of it is complemented by the excellence in build. It delivers the ideal balance between style and function. Made from high quality materials to deal with the daily uses of the bathroom.